The moon on July 12 was a super moon, a time when the new or full moon is at its closest point in its elliptical orbit to Earth. Super moons appear brighter and larger than regular moons, thus their nickname. 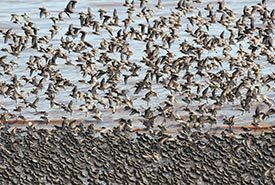 This summer, the unusually high tides that accompany the super moon coincided with the arrival of the first semipalmated sandpipers at the Nature Conservancy of Canada’s (NCC’s) Johnson’s Mills Shorebird Interpretive Centre on the Bay of Fundy. The upper Bay of Fundy hosts one third of the global population of semipalmated sandpipers each summer, or approximately 290,000 to 400,000 birds. 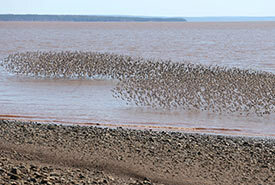 The Bay of Fundy’s rich mudflats are a critical migratory stopover site for these tiny shorebirds. They gorge on mud shrimp and other invertebrates to store up energy for the next phase of their long migration to South America. These mudflats at low tide are like a buffet for birds. But when the tide is high, the birds usually roost on the beaches because they can’t swim. Although the arrival of the semipalmated sandpipers from the Canadian subarctic is an annual affair, super moons are a relatively rare occurrence. Super moons cause the tides to rise higher than normal, as the gravitational pull of the moon is much stronger. The fact that the super moon and the sandpipers’ arrival fell on the same day this season caused some to speculate about the plight of sandpipers who found themselves without a space to roost during high tide. There was no need to worry, however, as this wasn’t the first time the semipalmated sandpipers had to contend with abnormally high tides. Previous interpreters at Johnson's Mills have seen the birds perform a beautiful display of aerial acrobatics known as “over ocean flocking.” This is where they fly as a group over the ocean while the beach is unavailable during extremely high tides. Fortunately, the majority of sandpipers were still in the subarctic, so the super moon only affected a few hundred “early birds” who extended their stay. 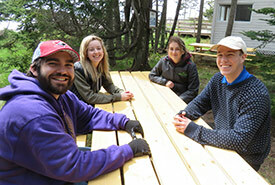 NCC staff welcome visitors to the Johnson’s Mills Shorebird Interpretive Centre throughout the summer. 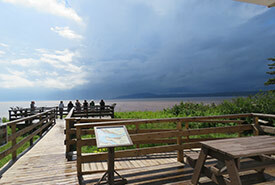 The centre and viewing deck are open seven days a week, and the best times to visit are from two hours before high tide to two hours after. There is another super moon on August 11, which means another opportunity to see the sandpipers’ amazing acrobatic displays over the ocean! This blog was co-authored by NCC Conservation Interns Kaylie McGraw, Savannah Leblanc, Liam Stewart and Matt Durnnian. 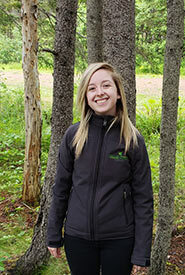 Kaylie McGraw is a 2018 summer conservation intern with the Nature Conservancy of Canada's New Brunswick Region. Read more about Kaylie McGraw.